Tag line: "What the one doesn't have, the other is missing"
In the 1990s, the Farrelly Brothers (aka Bobby and Peter) turned out a trio of uproariously funny comedies. My favorite of the bunch is 1996’s Kingpin, but ‘98s There’s Something About Mary had its moments as well (Matt Dillon delivers a line in that movie that had me laughing non-stop for about five minutes). Released in 1994, Dumb & Dumber is the one that started it all for the Farrellys, and as debuts go, it’s a doozy. But the jokes and general insanity are only a fraction of the film’s magic; ultimately, it’s the teaming of Jim Carrey and Jeff Daniels that made Dumb & Dumber the cult classic that it is. Best friends Lloyd Christmas (Carrey) and Harry Dunne (Daniels) are two of life’s losers. Aside from living in a shabby apartment, each one is out of work, leaving them with no money to pay the gas bill. As far as Lloyd is concerned, though, things are starting to look up; before he was fired from his job as a limo driver, he shuttled a beautiful socialite named Mary Swanson (Lauren Holly) to the airport and fell instantly in love with her. Lloyd even retrieved a piece of luggage that Miss Swanson left behind, and seeing as neither he nor Harry have much to do anymore, Lloyd recommends that the two of them drive cross-country to Aspen, Colorado, to return it to her. What Lloyd doesn’t realize, though, is that the bag Mary Swanson dropped contained ransom money, and that two criminals (Mike Starr and Karen Duffy) were about to grab it before Lloyd rushed in. Hoping to retrieve the ransom, the crooks also head west, prepared to use whatever means necessary to get the money back from our two heroes. Dumb & Dumber has more than its share of laugh-out-loud moments (Lloyd’s daydream, in which he imagines how Mary will react to seeing her case again, is comedy gold, though for me the funniest scene came late in the movie, when a playful snowball fight between two characters quickly gets out of hand). Of course, some of the film’s better sequences might have fallen flat had it not been for its two stars. Already a box-office sensation thanks to Ace Ventura Pet Detective and The Mask, Jim Carrey continueD his winning streak as the dimwitted Lloyd, who, despite his normally optimistic outlook, has a bit of a mean streak, which rears its ugly head several times throughout the movie (including one very memorable sequence involving a powerful laxative). This, combined with his unique facial expressions (not to mention the chipped tooth, an actual injury from his childhood), helps Carrey to once again delivers the goods. Normally appearing in more serious films (Terms of Endearment) as well as light comedies (The Purple Rose of Cairo), Jeff Daniels showed us in Dumb & Dumber that he was just as adept at gross-out humor as his co-star. Though not nearly as manic as Lloyd, Harry still has a knack for making a mess of things (the scene where he loses his job with a dog grooming service sets the tone for his character), and Daniels’ stoic performance is the perfect counter-balance for Carrey’s unbridled madness. 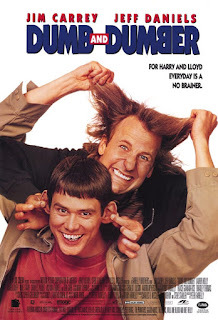 While their output in the new millennium has been hit and miss, the Farrellys captured lightning in a bottle with their first three movies, and Dumb & Dumber is the film that got the comedy ball rolling.